BLACK PANTHER: SHURI is in stores NOW! Originally published digitally in 2015, Marvel Comics is printing “The Deadliest of the Species” for the first time. Why now? Most likely because this is the start of Shuri’s reign as Black Panther and she’s one mega badass in the Black Panthermotion picture. This story is a collection of three subplots focusing on different characters as Shuri must take up the mantle with her brother out of commission and dangling for life. Who is the Black Panther? Under the protection of the Black Panther, the African nation of Wakanda has thrived. But after attending a secretive, mysterious meeting, T’Challa – the current Black Panther and ruler of Wakanda – returns home with severe injuries and locked in a comatose state. Though Wakanda is a powerful nation capable of defending itself, its power comes directly from its leader, the Black Panther – and in the event that T’Challa doesn’t emerge from his coma, a successor must be chosen. For Shuri, younger sister of T’Challa, the time has finally come to take up the mantle. But as she embarks on the dangerous ritual to become the new Black Panther, the stakes have never been higher. An unstoppable force is headed toward Wakanda: Morlun is back, and he’s hungry! This was the first time someone other than T’Challa held the mantle of the character and it’s an exciting development given Shuri is his sister. This collection also focuses on the spirit realm of the Black Panther corner of the universe which isn’t explored too often. The opening page is a doozy. This collection opens with Storm on her way to Wakanda as she introduces herself to the people. This was a shakeup at the time due to Black Panther and Storm marrying. It all crashes and burns at an opportune time when Black Panther’s ship comes crashing into Wakanda. The story picks up from there as Storm attempts to be the queen in his stead, Shuri is called upon as the rightful replacement of Black Panther, and T’Challa clings to life navigating the spirit realm of limbo. All of these subplots carry forward over the six issue run converging at the very end in an earned ending that’s satisfying. The story arc here confirms the love between Storm and T’Challa, pushes T’Challa very close to choosing death over life, and sets Shuri on a quest of understanding herself when given the task of protecting a people. Reginald Hudlin keeps your interest as Black Panther lies dying with the inter-political elements Storm must navigate in a strange land. She’s familiar with their customs more or less, but she’s clearly in over her head. This leads her down a fearless path that shows how much she’s willing to risk for love. 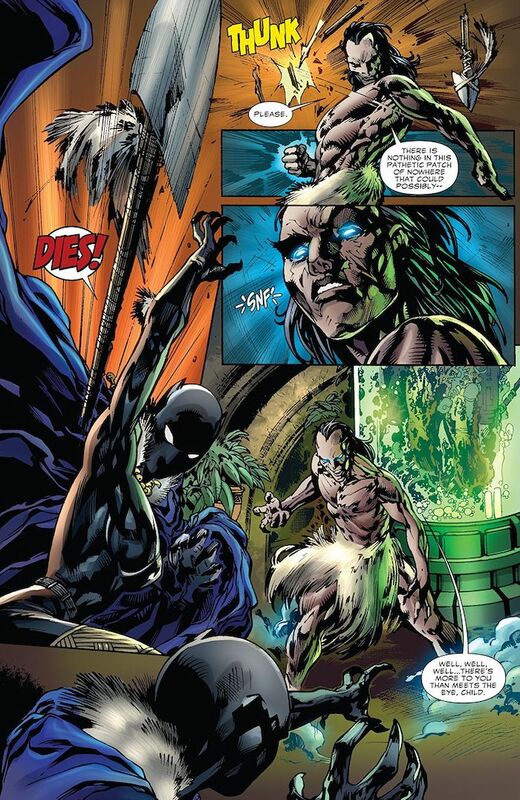 T’Challa must endure the promises of a god of death that is creepily designed and rendered by artist Ken Lashley. I got pangs of Superman’s death via this story as T’Challa hangs on for dear life. 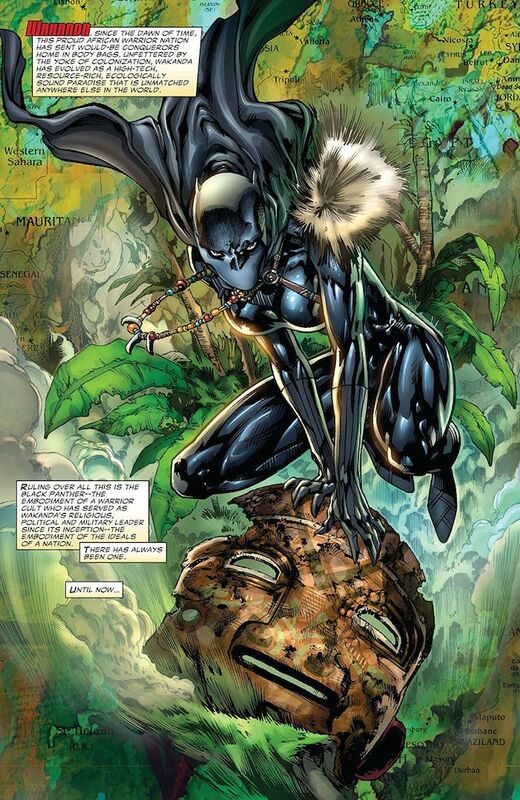 Shuri is the star of the show however, as she attempts to live up to the Black Panther costume. It’s something she’s always wanted but never had the chance to earn and she goes through a few tests here. Hudlin surprises with a twist to the results of her test, but that only makes her heroic acts in the end all the more pleasing. Lashley does a good job with art, be it the spirit realm, Shuri’s fever dreams, or Storm’s political posturing. I appreciate the fact Lashley doesn’t draw Shuri in sexualized poses (despite the covers) and she’s rendered in the strong and heroic way as she deserves. Some of the best scenes come early on featuring Dr. Doom and Lashley do a fantastic job giving Doom the scars and little details that show off his technological prowess. A badass moment to be sure. Two things bothered me in the middle portion of this title. The first is how Shuri doesn’t actually wear the Black Panther costume till late in the collection. Each cover teases she’s the Black Panther but we don’t get that reveal till the last chapter! The second thing is the tail end of Black Panther’s spiritual journey. There’s a point in the narrative where he’s aware of where he is and aware he doesn’t want to die and then he waits. Storm shows, and they wait some more. There’s a reason for the waiting, but it’s as if it wasn’t plotted quite well enough to flow into the admittedly pleasing finish. 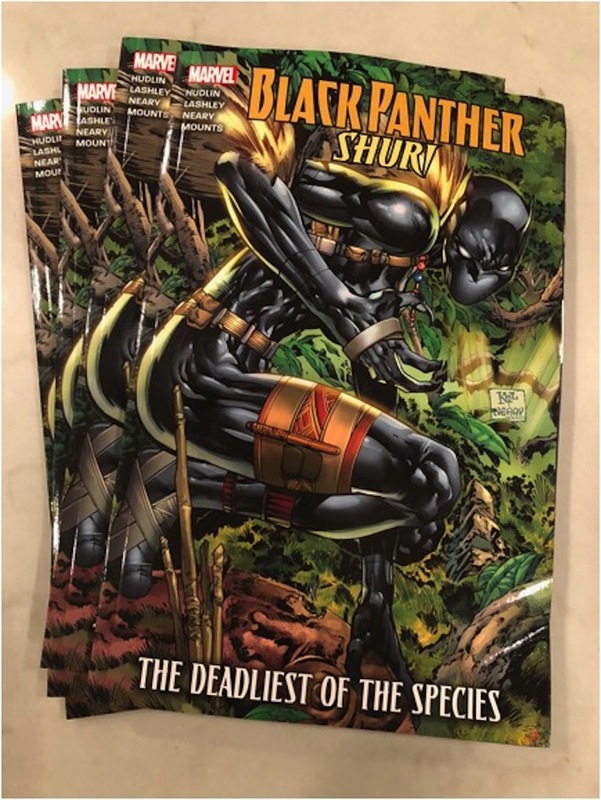 A good collection that shows off a very cool time for Shuri’s character as well as the always compelling spiritual realm Black Panther must navigate from time to time. IF you dug Shuri you’ll dig the start of her time as Black Panther, but above all you’ll dig how well this story comes together in the end.